Looking for a magazine theme that is versatile and easy to use? Diginex is the answer to your needs! With this product you can easily create or upgrade your current WordPress website and take it to a whole new level. We’ve created a product that is going to let you create and manage your website as you need, taking of the limits you had with your previous themes. It is so incredibly well built, with a whole new framework which manages to provide incredible performance for heavy loaded content website. We all know that images and media is the main thing for a website so we need to make sure that we’re using and showing it the right way. As you can see from our demos, this theme is truly a trendsetter in matter of layout options and elements. You can use it for almost anything, and we showed this in our demos. Not only it can make your content more appealing but also gives you the possibility to control your page layouts on desktop, tablet landscape, tablet portrait and mobile devices. Control the way you content looks like and works for each type of device your visitors are using. Diginex comes with tons and tons of options, starting with unlimited color settings, image lazy loading features to let your media load only when needed so your website loads faster, 3 types of pagination options for your post listings, preloaders, lightbox options to enlarge images, Facebook comment, AdBlock detector software that let’s you remove content for visitors with AdBlock, built-in like system, sharing options, sortable meta options so YOU can choose which meta details should be shown in the post views or on the single pages. 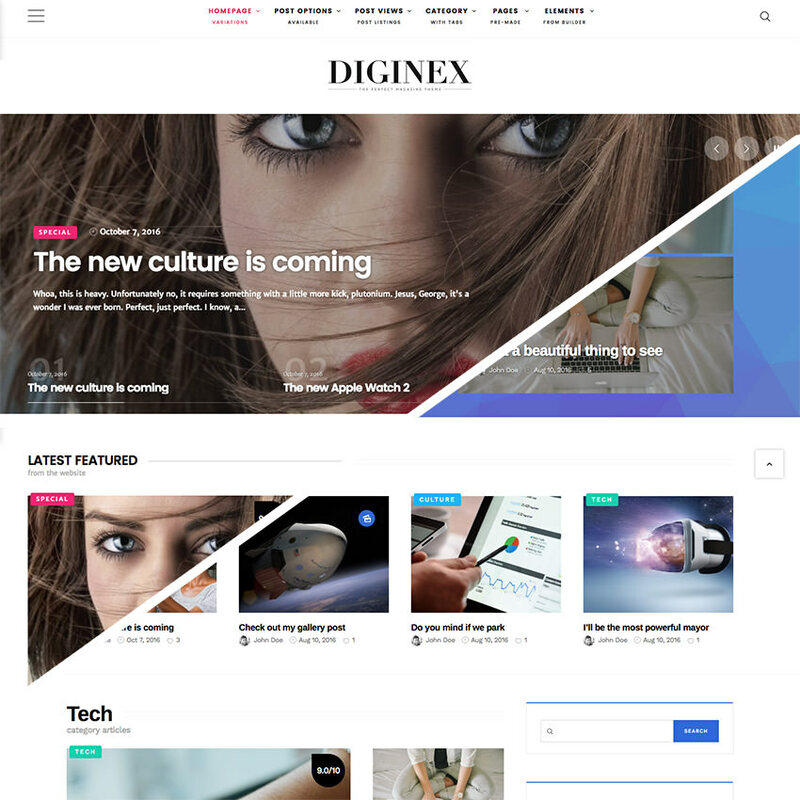 Not to mention Diginex has dynamic image resizing which let’s you change the image proportions and sizes you want your images to be cropped on different sections of the website. As you can understand, Diginex is a real tower of power when it comes to settings and optionality. Wait, we didn’t mention the whole Google library that is available for choosing the right typography for your website. Also, as standard for our themes – unlimited sidebars were included. In this theme we really made sure that you get exactly what you want when importing. No more additional settings, no more things to add. Just click the one-click theme demo installer and wait for the content to download on your server. Just upload your logo, change the branding and you’re ready to go. We’ve even set up a demo video showing how this happens: Diginex Demo Installation Video. To make sure you have the right options when adding the content to your pages we included 6 single styling options. 6! Each with sidebar settings (which by the way can be made sticky so they can follow you when you scroll down). Depending on the content you have, the images and other options you can easily switch between them so your content looks extra cool! So, why talk and read a lot when you can check for yourself? Check the demo right now!